We understand that it is important for your customers to be able to contact you at any time, which is why we're building companion apps with push notifications, so that you can reply on the go! We're also experimenting with a Mac desktop app. Just search the Apple App Store for GoSquared Inbox or follow the link – download here. Just search the Google Play Store for GoSquared Inbox or follow the link here – download here. We're still gauging the demand for a desktop app so we haven't yet committed to supporting it full time. However feel free to try this early experimental build with the caveat that currently we cannot guarantee long term bug fixes or ongoing support. Unreliable re-connection when waking your laptop from sleep (easy to fix by quitting and re-opening the app). 'Copy link' button in the right hand sidebar may not work. Drag the Inbox app into your 'Applications' folder. Right click on the app, and select 'Open' – this is a quick way to say that the app is from a trusted source without having to change your system settings. Unzip the folder to somewhere safe. Open the folder and find the 'Inbox.exe' file. Just double click on 'Inbox.exe' to open the app. You can then optionally choose to create a shortcut for 'Inbox.exe' or pin it to your desktop etc to find it again quickly in the future. This isn't quite the same as a fully native app but it provides almost identical functionality. 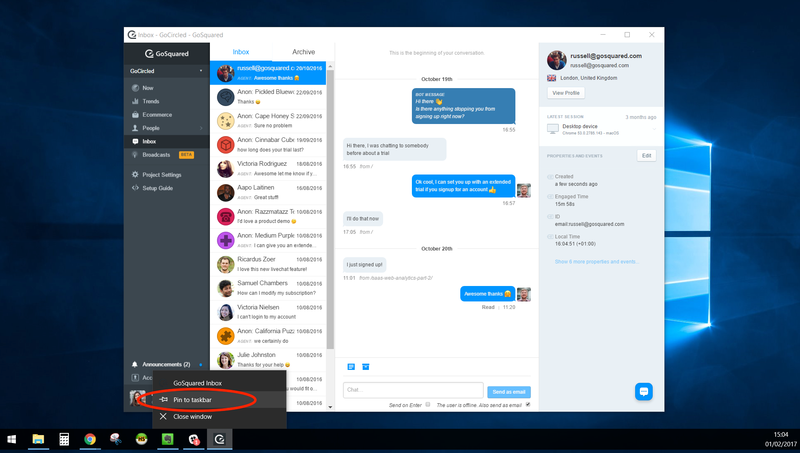 It allows you to run Inbox in a dedicated window that can be pinned to your desktop/taskbar and, providing the app is open, desktop notifications will work too. If you're not already using Chrome, download the Google Chrome browser. Log in to GoSquared Inbox in a new Chrome tab. 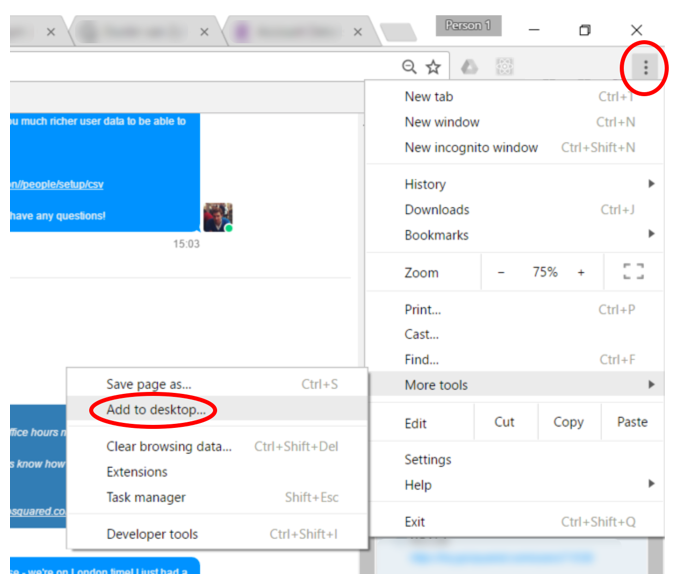 Then, open the 'Chrome options' menu in the top right of the window (the 3 vertical dots) and select 'More tools > Add to desktop'. This will open a box where it will ask you to name your desktop app. Make sure the Open as a window option is ticked. Then click 'Add'. 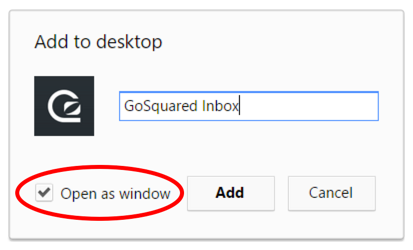 This will add the GoSquared Inbox app to your desktop. When you open the app, it will open Inbox in it's own dedicated window that you can choose to pin to the taskbar if you wish. Pro tip: press the / (forward slash) key on your keyboard to show and hide the GoSquared sidebar if you want to use Inbox full screen.